Therez: . . . and Tom - you've been adopted! for clarification, i believe, it's Therese. that's how ive read it on various sites like flickr, etc. sorry, seems people were feeling slightly awkward with possible misspellings. hope this helps (if it's even correct). It is. Don't worry. Also, all 6 hours of the Best Show's marathon were amazing. Couldn't have asked for a better one. Loved hearing the live version of "Timorous Me" by Teddy Rockstar, and then "Someone Saved My Life Tonight" was absolute amazingness. I believe Terre T had a part in that too, just to clarify, Mr. Scrivener. Anyway, I'm glad I'm getting the premium. Wally and the Z-Man will get to listen to the cds with me, but I forbid them from taking ownership of the Dogmo Totebag and my FOT card. The Paul F Tompkins call was really great. PFT sounded like the Hulkster last night. So this is about Paul F Tompkins on the second week of the marathon, but I loved his impression of Tom during early period Best Show, which demonstrated exactly what the difference between the show then and now. Tom now seems much more relaxed and a better judge of how long calls should last. Not that the older shows (which I'm working my way through very slowly) aren't entertaining, they just have a different feel. 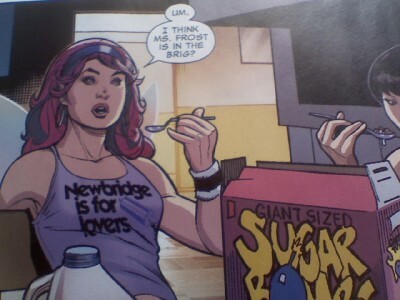 So, does this mean that Newbridge, NJ is part of the Marvel universe, and this character has visited it? Or that Tom Scharpling and the Best Show exist in the Marvel universe, and this character is a fan? For the comic-book challenged among us, could you tell us the title that comes from? I'm guessing the X-Men? Dorvid going nuts and stair-surfing was great. *Tom calling in to his show and walking to the bathroom to splash water on his face.